Princessly Polished: Nail Polish Necklace Giveaway Winners! Nail Polish Necklace Giveaway Winners! 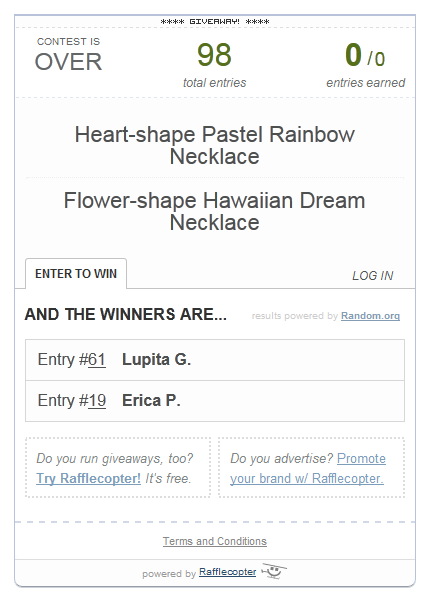 Congratulations to the two winners of my Nail Polish Necklace Giveaway! Lupita, who chose the lovely Flower necklace, and has a newer blog (with some really good nail art!) here. And Erica, who chose the Heart necklace. She recently changed her blog's name, and can now be found at The Polished Chic. I hope they enjoy their necklaces! Seven Summer Shades Giveaway! Win Mini Polishes! Final Week of Google Reader & GFC!